A few days ago Milky Way Project user suelaine posted an image of this pretty bubble on the Talk forum, asking whether it was a supernova. As supernovae – or rather, the debris that’s left behind after they explode – often have this kind of shape, I initially thought she was right. But when I looked up the coordinates on SIMBAD – the astronomer’s guide to the Galactic sky – I discovered it was a beautiful example of a more peculiar type of object: a Luminous Blue Variable star (LBV). LBV stars are massive stars, often with a few tens of times the mass of the Sun, that are approaching the end of their lifetimes. The fuel in their cores, needed to maintain nuclear fusion, is running out. This makes them unstable, causing them to flare up at intervals. As they’re not able to hold on to their outer layers, powerful winds eject matter into the surrounding interstellar medium during these eruptions, and the star can be sen to brighten significantly over several months. LBVs are on their way to exploding as supernovae. The evolution of such massive stars once they run out of fuel proceeds very quickly, so these objects are extremely rare: only around a dozen are firmly known in the Milky Way Galaxy. The best-known examples are Eta Carinae and the Pistol Star, perhaps the most luminous star in the entire Galaxy. Because there are so few LBVs to study, there’s a lot about them we don’t know. This particular LBV, prosaically known as G24.73+0.69 (its galactic coordinates), was discovered in 2003, and lies at a distance of around 5 kpc, or 16000 lightyears. As well as the compact orange bubble this larger view of its surroundings shows that there is a second, larger shell, more bipolar in shape than a true ellipse. The star and its environment were studied in detail in a very recent paper by Argentinian astronomers Petriella, Paron and Giacani. They discovered a dense molecular shell tracing the outer bipolar nebula. They suggest that the inner compact bubble is the result of an LBV eruption, and the outer bipolar shell perhaps caused by more gradual mass loss during the star’s “regular” lifetime. 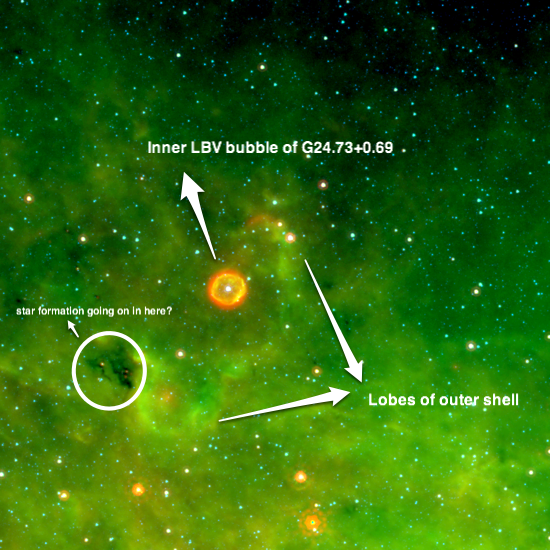 Interestingly, they also find evidence that perhaps new stars are forming near the lobes of the larger shell. They suggest this may be triggered star formation in the swept-up gas, but their observations can’t confirm that. I didn’t know much about LBVs myself, so I was pretty excited with this find. Keep posting your interesting objects to the forum – perhaps we can find more LBVs or other cool types of objects. 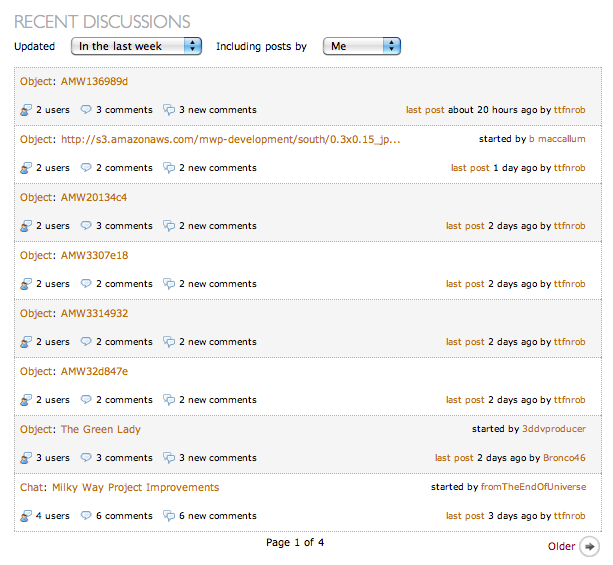 Feedback from everyone about the Milky Way Project has been overwhelmingly positive. 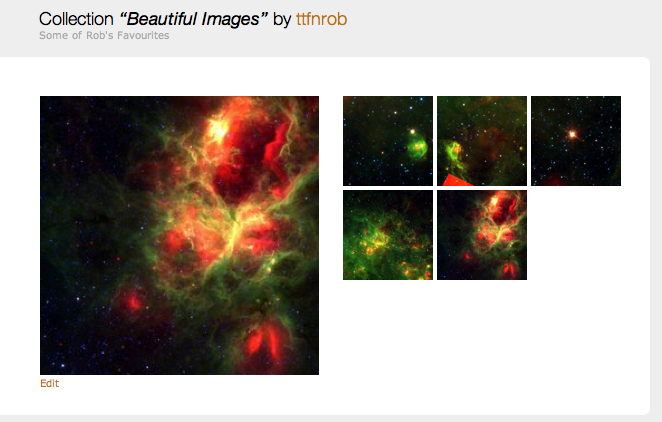 You all seem to love the images and the interface. One thing that is always requested though, is more tutorial examples of the things we’d like you to flag as areas of interest: green knots, dark nebulae, star clusters etc. We decided it was best to use Talk, the Milky Way Project’s discussion/collections site, to show off examples of the objects you might spot as you draw all over the galaxy. 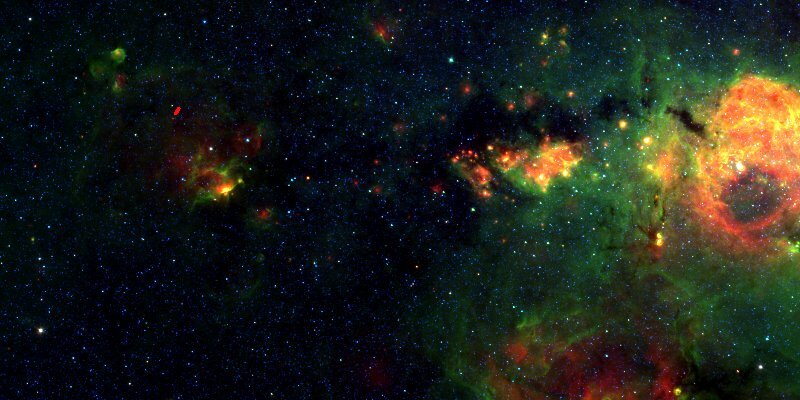 We’ve built collections of green knots, dark nebulae, small bubbles, star clusters, galaxies and fuzzy red objects. The great thing about using Talk to do this is that we can easily add more in as we – or rather you – find them. All the new example collections were built using the classifications you have made so far. We used your first 100,000 classifications to create lists of the objects most regularly flagged in each category. Hopefully you will find these useful in learning how to spot some of the amazing things that are out there in the Milky Way (and sometimes, beyond)! A side effect of creating these collections was that I found the image with my green coffee this morning above along the way. 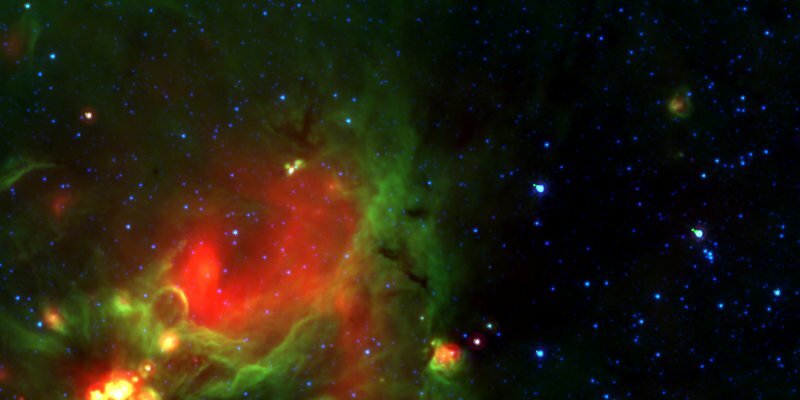 It appears to contain green knots, small bubbles, dark nebulae, red fuzzies and a small star cluster. If anyone can see a galaxy in there it’s a full house! You can obviously, also discuss this image on Talk. If you have comments or suggestions for the Milky Way Project, you can email us on team@milkywayproject.org. Today we have launched The Milky Way Project. The Milky Way Project aims to sort and measure our galaxy. Initially we’re asking you to help us find and draw bubbles in beautiful infrared data from the Spitzer Space Telescope. Understanding the cold, dusty material that we see in these images helps scientists to learn how stars form and how our galaxy changes and evolves with time. As well as drawing out bubbles in our galaxy, we’re also asking you to mark other objects such as star clusters, galaxies and ghostly red ‘fuzzy’ objects. We’re asking you to help us map star formation in our galaxy! Take a look at our tutorial page for the complete run down, with examples. Also launching today is the Zooniverse’s new collaboration and community tool: Talk. Milky Way Talk resides at http://talk.milkywayproject.org and there you can find, collect and comment on the objects you see in the Milky Way Project. 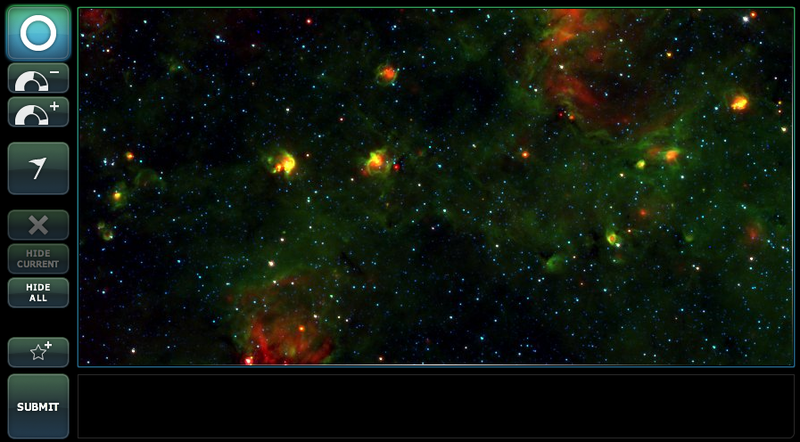 Every time you classify an image in the Milky Way Project you will be prompted to ‘discuss’ that image via Talk. Talk lets you collect objects together and shares those collections with everybody else. Talk is a brand new feature, developed in-house at Zooniverse HQ. It continues to evolve and change as you use it and we hope that through the Milky Way Project, we can make Talk even better. Don’t forget, you can find us on twitter @milkywayproj and we hope to see you soon on Milky Way Talk!